I wasn't looking for instances of mistranslated signs when I was in Taipei in April, so when I went digging through all my photos for this post, I didn't find many photos of noteworthy or particularly amusing uses of English. A few of these are classic Chinglish (more examples on the very popular Engrish site), others I just thought were funny. "Attention! 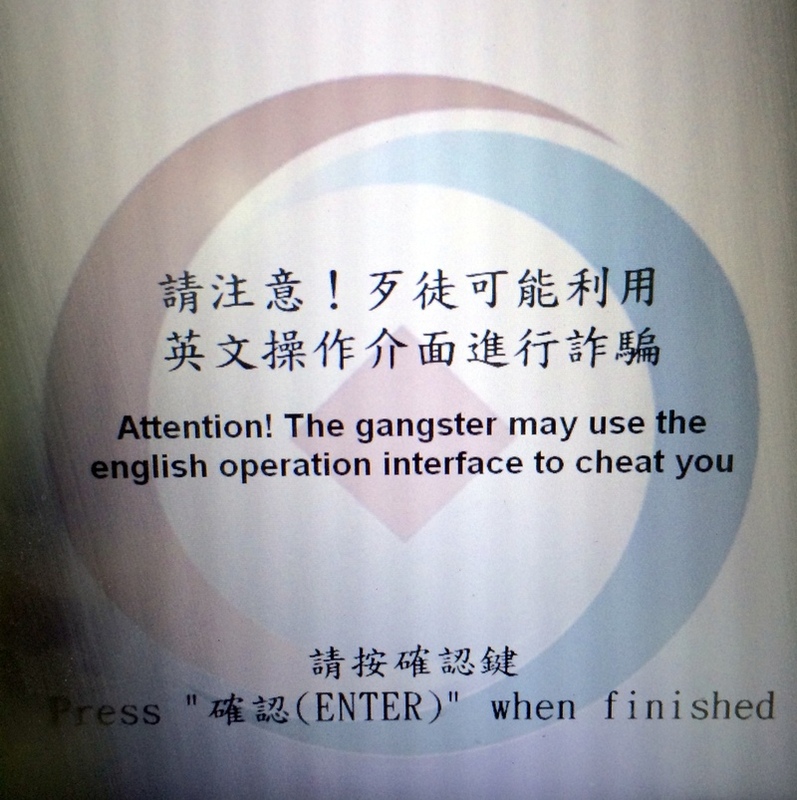 The gangster may use the english operation interface to cheat you"
This message recurred over the course of my trip, but not every time I tried to use an ATM. This particular ATM when I was quick enough to snap a picture was in the Guang Hua Digital Plaza. Each time, It made me wonder, who is this gangster? Do they just mean thief or con artist? In Berlin, the signs at the public transit ticket remind us to be aware of "tricksters." How is this gangster going to use the English operation interface to cheat me? 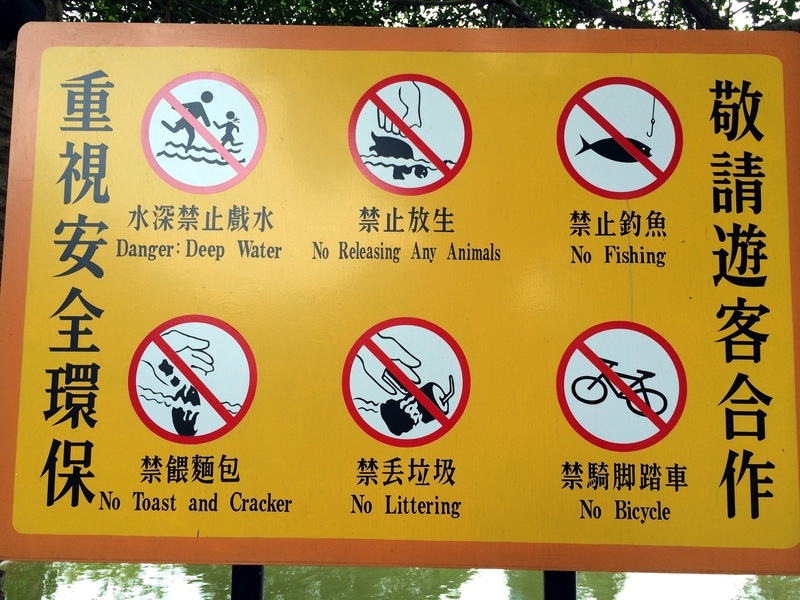 This is the classic example of Chinglish, confusing rules on signs in public parks. This isn't a very good one though, since almost all the strictures make sense, except for "No Toast and Cracker," and even that one makes sense if you look at the picture – it's just about not feeding the fish. I'm going to charitably assume that people were releasing animals into the pond, prompting the authorities to include that rule. 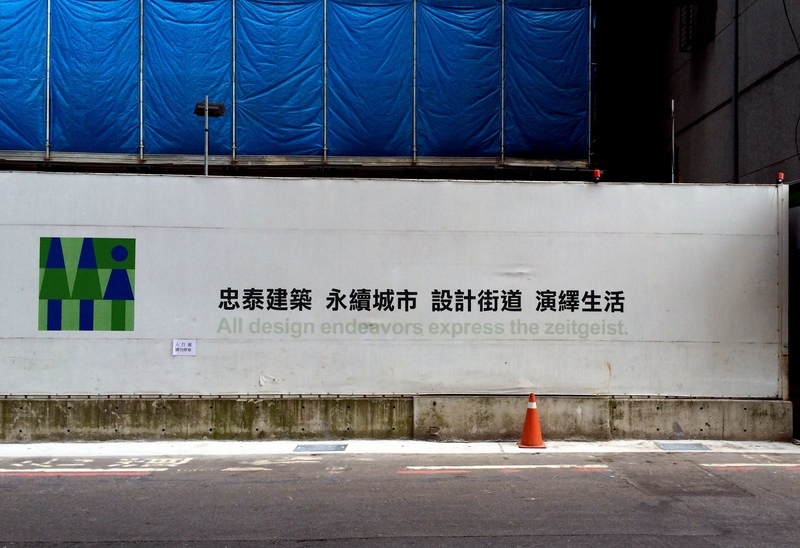 "all design endeavors express the zeitgeist"
This is not exactly poorly translated, it just seems very high-brow for what is basically gussied-up scaffolding. It would make a good debate resolution, if you think about it... who wants to take the negative? I feel a little bad for pointing this one out, since spelling mistakes can happen to anyone. 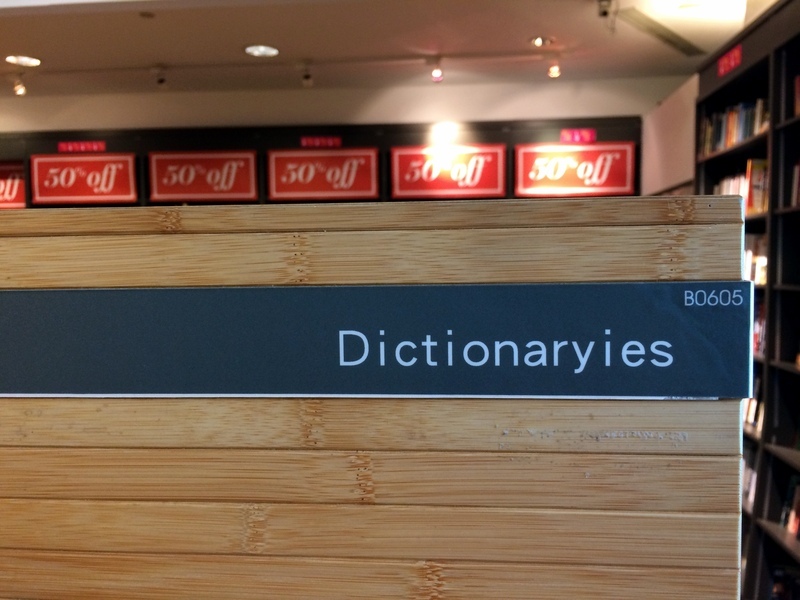 It seems particularly egregious though, given the word that is being misspelled, and the fact that it is in a fancy English-language bookstore in the mall at Taipei 101. 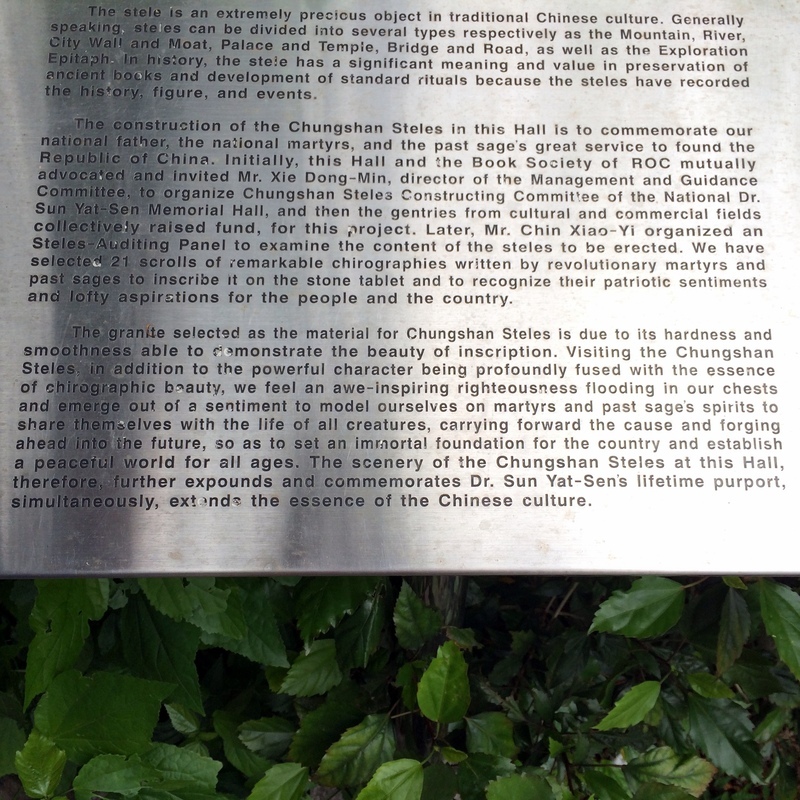 "Visiting the Chungshan Steles in addition to the powerful character being profoundly fused with the essence of chirographic beauty, we feel an awe-inspiring righteousness flooding in our chests and emerge out of a sentiment to model ourselves on martyrs and past sage's spirits to share themselves with the life of all creatures, carrying forward the cause and forging ahead into the future, so as to set an immortal foundation for the country and establish a peaceful world for all ages." They said a lot in that one sentence, I don't need to add any more. I've thought this for a while, but the last week of exploring Taipei has made me sure: the panorama option is a really underrated iOS camera feature. Square: How stupid, just crop the image later. Video: Very convenient, but so far all I've done is accumulate some shaky footage. Slo-Mo: Still no easy way to export to Instagram or Facebook. Filters: The native iOS options are decent but I still prefer Instagram, or even VSCO's advanced options. HDR: fun to play with at first but the difference between regular and HDR is pretty minimal, and I often prefer the non-HDR version. I've had a lot of fun taking super wide-angle shot with it since panorama was included in iOS 6 (fall of 2012). Before it became part of iOS, I'd tried a few specialized camera apps, but they always ended up looking funny, and I found one desktop tool called Hugin for stitching pictures together on the computer, but it wasn't that easy to use. I did use it to create a beautiful photo view from the top of the US Bank building in San Francisco. I admit, I've got a thing for views, whether from the top of a hill or a tall building, or even just a big open space. Particularly when I'm traveling or visiting touristy sites, taking a picture of up to 240 degrees helps capture the experience of being there. Yesterday I went over the river and through the woods to Shilin to visit my grandmother (on my father's side) which is the same area where the famous night market is. My grandmother lives in an apartment with one of my uncles and his wife and a live-in caretaker. She's been in that apartment for a couple years; before that she lived with a different uncle. The house we used to visit her in when I was a kid was torn down to make way for what I think is now a public park. I haven't been back to visit that area, and actually I couldn't point it out on map. The details of what happened are beyond me, but it's possible that the whole neighborhood was built on public land, with a semi-legal status like a shantytown. Building- and neighborhood-wise, though, I couldn't tell you the difference between that area and the part of Taipei New City (formerly Taipei County) that my other grandmother lived in. Don't get me wrong, I like Nick Pitera's covers -- I first ran across his video entry in a Disney contest for people singing A Whole New World (he sings both parts). But I still think it's kind of sketch to change the title and tags of a video that's almost two years old to take advantage of the media buzz surrounding Lin Yu Chun, the Taiwanese singing sensation, and his performance of I Will Always Love You (by Dolly Parton, probably most well known as sung by Whitney Houston). If you haven't seen Lin Yu Chun on Taiwan's "Avenue to Stardom," where have you been the last week? Quick, watch it! PS My favorite bit from the AP article on Lin Yu Chun? "Being fat draws a lot of mockery in our society," he said. To cope with the pain of his exclusion, he locked himself in his room and sang along with the songs of Celine Dion and Mariah Carey . Lin Yu Chun, we're the same person! Update: On the Ellen Show!